Protestors join together in a rendition of “Solidarity Forever” in front of the Holyoke Center Thursday evening before marching through Harvard Yard in opposition to proposed reductions in numbers of Harvard’s library workers. 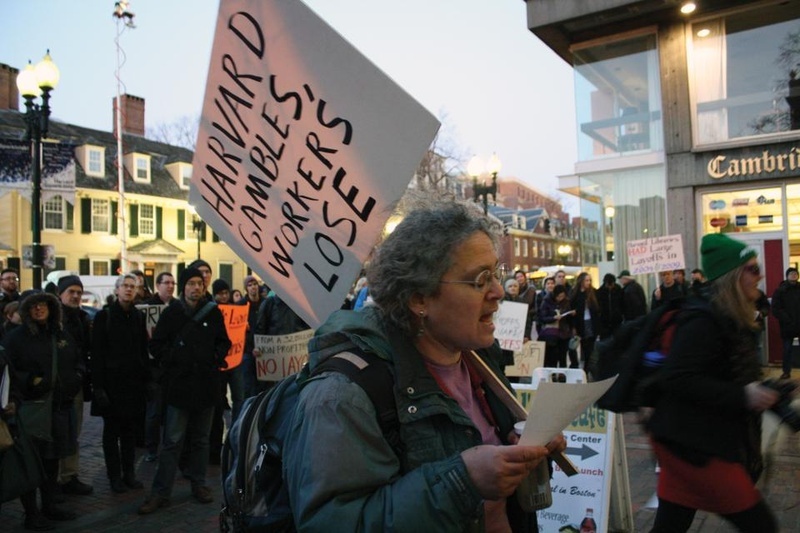 A crowd of more than 100 protesters gathered outside the Holyoke Center Thursday night in response to plans to reorganize Harvard University Library that could include involuntary staff reductions. The protestors chanted and marched in a circle, after which several workers, students, and other supporters spoke to the crowd. They then walked into the Yard and circled Massachusetts Hall several times. The rally sought to increase awareness in the Harvard community about the library workers’ concerns as well as to display opposition to the administration’s intentions, said William P. Whitham ’14, a member of the Student Labor Action Movement. “I hope this lets the student leaders, lets the faculty know that this ‘glorious’ reorganization has a human cost,” Whitham said. Library assistant Jeffrey Booth, who has worked at Harvard libraries for nearly 26 years, said that the threat of staff reductions makes him worried about his family. Library employee and elected Harvard Union of Clerical and Technical Workers representative Emeka F. Onyeagoro, who spoke at the rally, said that he was opposed to the layoffs, which he said threatened an estimated 800 to 1,000 workers. Onyeagoro said the layoffs have no financial basis, but are an unjustified attempt at greater efficiency. Layoffs would also negatively affect workers who kept their jobs, since they would be faced with a greater workload, Onyeagoro said. Ricardo R. S. Rey, a teaching fellow in the history department, said that he opposed the layoffs for practical, as well as philosophical reasons. He recalled an instance where he wasted time searching for documents with HOLLIS before a librarian helped him find a wealth of materials for his class. “How are we going to find this [without librarians]?” Salazar said. “So far we haven’t seen a change of heart, but we’re going to keep pressing, and press harder,” Jaeger said. Jaeger said that the union still had two major concerns that the library board had not addressed sufficiently, if at all.